What are Same Day Delivery Gifts? Wow them with this beautiful arrangement of fresh fruits, gourmet cheeses and crackers. With so much to choose from, this is the perfect gift to send to a family or to the team at the office. Whether you’re congratulating them for a job well done, thanking them for their efforts, or sending your deepest sympathy, this basket will be well received no matter the occasion. We will find a preferred shop in the recipient’s delivery area to fill your order and hand deliver it as if it were one of our own. You still get the same guarantee as if we filled the order, but with the convenience of same day gift delivery. All of our same day gift baskets are one-of-a-kind creations and are custom made by hand so each one will be different. 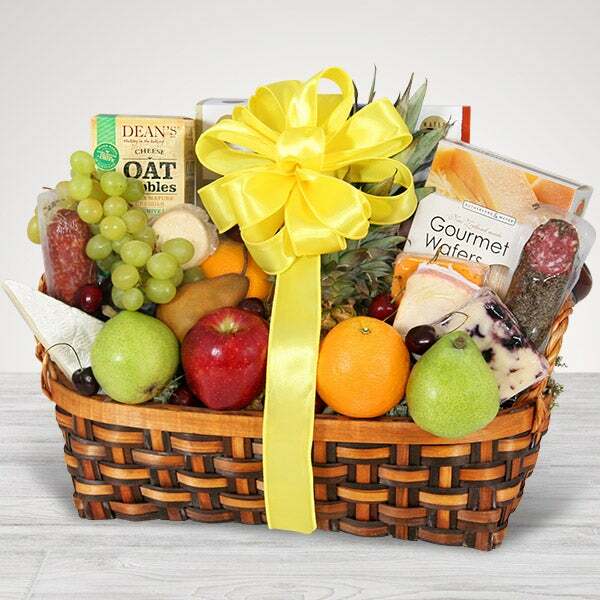 The item pictured is a sample fruit, cheese & crackers basket, but the actual item delivered as well as its container will vary depending upon local availability. The quantity and selection of fresh fruits, cheeses and crackers will change depending upon the size of the gift purchased. This product cannot be purchased using any discounts and/or promotional codes.